What a year this has been. I have traveled to places I previously never even knew existed. I have climbed mountains and enjoyed incredible views (including Mount Whitney, the tallest mountain in the lower 48 states). I’ve gazed upon turquoise water and glaciers, watched lightning dance in the desert, and experienced the winter wonderland that the Eastern Sierras can be. I’ve visited beautiful coasts and quiet redwood forests. More than 16,500 exposures fired this year. From that it has been difficult to narrow down my favorites, but I have come to a list that I am pretty comfortable with. I will say that many of these trips were made possible by the Wilderness Travel Course offered by the Sierra Club. This class opened my eyes to many many more photographic possibilities and to explore those possibilities safely. I highly recommend this class! Fully half of these pictures were taken on trips related to WTC class, or from class trips directly. Now, onto the pictures. These are arranged in chronological order. 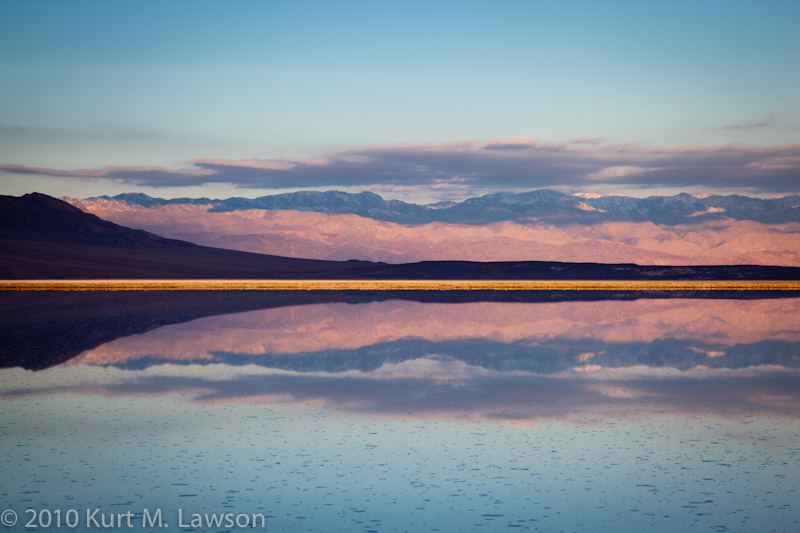 My sole trip to Death Valley in 2010 yielded one of the most amazing lighting moments I’ve ever seen. When I took this photo, a band of clouds behind me was blocking the sunlight from hitting the dark hills, while allowing direct sunlight to illuminate the salt encrusted mud formations that were closer to me. The result was this wild razor-thin slice of sunlight sandwiched between clouded hills and then rendered symmetrically from the water’s reflection. It was, for lack of a better word, magical. 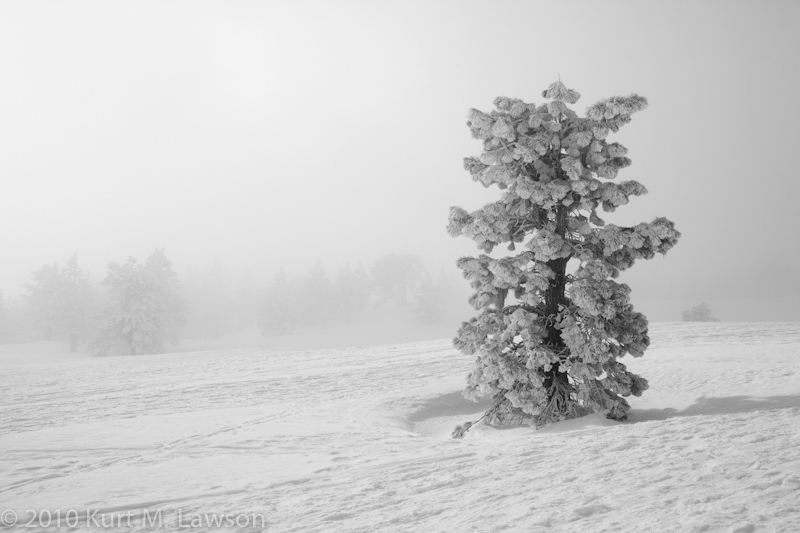 This wonderful little tree stood out in near white silhouette from the fog and falling snow beyond. I encountered this tree on a snow travel day with WTC where we learned to walk with snow shoes. I loved the simplicity of a black and white interpretation of what was nearly a monochromatic scene anyway. Be sure to click on the flickr link to view the panorama much larger. This scene was the view just above our camp during the “snow camp” trip at the end of WTC class. To experience the beauty of the Eastern Sierras at the end of winter was quite the treat. All my friends said I was crazy for camping in the snow, but it is truly an amazing experience. Oh, Anacapa. Our troubled adventure to this island didn’t quite work out the way we had intended, but nevertheless I’m thankful to have this image above all others from that day. These great pelicans were traveling towards the rock as our boat idled so we could look at seals. I fired off a series of shots to try and see what they would look like over the rock itself. This was the prize exposure from the bunch. For this I was at the right place at the right time. Misadventure at Anacapa allowed us to spend a morning near Gorman, CA investigating the California poppy fields and other wildflowers that were in bloom. The clouds were moving crazy fast. We were not sure at first if we would get any interesting skies at all since it was so gray further south in Los Angeles. But, I’m glad we went out anyway because the incredibly dynamic light made for some awesome images. Here the sun was dodging in and out of the clouds extremely fast (check out the scene at the end of that linked video). I waited until the foreground trees were in full sun with the hills behind in shadow and snapped off this picture, black and white fully in mind. This last July I picked up a shiny new piece of glass, the venerable 100-400m Canon zoom lens. Like anyone would want to do, I set out to try and find something to take pictures of with this new acquisition. So, I headed on my bike to the beach to see what I could see. On my way back from my long bike ride, this scene presented itself to me. A dark cloud hung over Santa Monica and Malibu (while it was sunny from Venice on south). This dark cloud had a hole at the Santa Monica Mountains where the sun beamed down in what we call “god rays” in visual effects. In the foreground, big waves smashed on rocks and surfers waited to ride. I spent quite awhile waiting for the perfect shot before I finally moved on. I must have fired off 400-500 pictures seeking “the shot,” and this is the one that was my favorite. Many, many years ago I paid a very short (perhaps tragically short) visit to Sequoia and Kings Kanyon National Parks. This summer I had the awesome opportunity to go camping there with friends. And naturally that meant hauling all my camera gear along. I was rewarded with a number of memorable images. I also got to see far more bears than I thought I would, including a close encounter within about 15 feet. This image is of a nice couple Giant Sequoia redwoods in Kings Canyon National Park. Fire had damaged and split the trunk of one of the trees, leaving a crack perhaps 30 feet tall or more. In the lower part of the crack there was a little notch like a tiny window, and I just happened to notice the sun was around that area. So, with a little move over I got the sun in the notch, and through the lens flare created with the sun and the f/18 aperture it created this nice big sunburst from the notch. This is I think my favorite picture from that trip. I love these trees! Big Pine Lakes – Few things I can say other than “wow” about this stretch of the John Muir Wilderness. It’s just a magical place. The glacial water has millions of tiny suspended particles in it which gives these lakes their incredible hue. Here I am in this picture, standing in awe looking at this landscape. The rocky mountain before me is Temple Crag, a photogenic 12,999 ft temple of granite. Never before had I witnessed a landscape such as this with my own eyes. I’ve always been a fan of the black and white landscape, having studied the works of famous photographers like Ansel Adams. This is my favorite black and white from the trip to Big Pine Lakes. These are snow fields at the base of the immense cliff face of Temple Crag, which I have dubbed its chin. A nearly 4 year old goal – to climb Mount Whitney was fulfilled this year. Though I haven’t yet written up the blog article I intend to, I can at least say that it was a really incredible trip. The scenery is wonderful and the sheer physical challenge was exhilarating. This image is one I was happy to get. A little sunburst right as the sun (and its warmth) disappeared behind the edge of the Eastern Sierras, which I matched with this one of a little sunburst as the first rays of light broke over the Sierras to our east. I love star trails. This one just happens to be one that I like from Joshua Tree National Park. This exposure was 30 minutes long as was taken on a backpacking expedition to summit Quail Mountain, the tallest peak in the park. This image was a total surprise. While on that same expedition, I awoke really early to find a developing thunderstorm to our southeast. Our group had been caught in one in the first hours of our hike the day before, and I was weary of this one as it had tons of lightning activity. Since I did not have my full size tripod, I relied on my little Gorillapod focus for this (as well as the star trail shot above). I set the exposure for 5 minutes at f/5.6 and aimed it at the storm. I had no idea what I would get, but lo and behold I was blown away at the resulting image. Unfortunately, with my headlamp on, I wondered into the shot in the foreground forcing me to crop that part out. However the rest of the image is very lovely indeed, and motivated me to continue trying to capture lightning well into the morning. And speaking of lightning, I had always wanted to capture lightning photos. I had never really had the opportunity in the Midwest growing up. There was just too much stuff to clutter the foreground and block the view, and there was also too much haze between the storms and myself to get a clear shot. This morning in Joshua Tree was different. I was able to capture lightning as I never had before. I set the camera to continuously take photos while myself and my fellow hikers packed up our tents to get out of there before a storm could find us. I made a couple of adjustments as the morning light began to brighten our world. This was my favorite lightning strike photo from those attempts. The lightning here is striking a little over a mile away. Later in the morning on that same trip I saw this scene before me. I loved the sky and the backlight on this solitary tree, a few hundred feet from a forest of his brethren. I just loved the quality of light and the low level fog from the rain the night and day before. In my time in southern California, I have been wanting to seek out fall color aspen trees to photograph. Work seems to always interfere with this quest, but I was determined this time. Leaving much later than I had intended, I still made an 860 mile road trip in two days, crisscrossing the Sierra Nevada range through Yosemite and visiting the eastern flanks lf the Sierras in search of their aspen groves. Here is an image I love and purposely planned for in short order. While attending the graduation from WTC I shot a couple images of our large group camp. I then also noticed that the rocks around where I was standing were illuminated by our large campfire. I swung the camera around and made an exposure. The intense red and the moonlight were fantastic! The moon was sinking fast so I made another exposure, but this time the fire had died way down and the foreground rocks had lost their presence. So, I made another exposure and ran down to flare up the fire just as the moon was passing behind the crest of the rocks. I stopped down to f/11, the smallest aperture I dared in the dark light, to try and maximize the starburst effect like I had done on the Sequoia shot above. The exposure time of 13 minutes was a total guess based on the previous few. The result turned out great. The moon made a moonburst pattern just as I wanted, and my only complaint is that I didn’t let it go a little longer to get more light on the foreground rocks. With the pure excitement of the moonburst shot fresh in my mind, I ventured around the camp to take more firelight pictures, and this is my favorite of that bunch. Star trails in the blue sky behind and moonlight and firelight combined on the rocks in the foreground. Oh what a tree! This amazing tree greeted my father and I as we ventured into Muir Woods National Monument for the first time in 12 or so years. The soft backlight of these ferns was magical to behold. I had fond memories of this place from my sole previous visit, and this new one left me with the same awe and the same feeling of serenity. This was my last picture as we left Muir Woods. Something about this view stopped me and compelled me to take one last photo. The light was nearly gone, as the sun had set and we were proceeding through twilight. This scene was just so peaceful that I couldn’t pass it up. I think the totally diffuse, soft light captures the feeling I felt at the time. We were basically the last two people in the park and I just soaked up the silence of the forest while I patiently awaited this long exposure to complete. The redwood forests are truly great places on Earth. Finally, a sunset image from the wonderful El Matador State Beach. I was capturing images from this sunset for awhile this fine evening. A group of three cormorants were waiting out the sunset on a rock. I took some wider views of them before deciding to frame up a closeup. Once I zoomed in, the first bird decided to take off. This was followed by the second. And finally the third one was getting ready to go. I had missed the shot I wanted but was able to capture the final bird as it stretched its wings before taking flight. I think it made for a fantastic image and a nice one to round out my 20 favorite pictures from 2010. At least that’s what it was when I arbitrarily cut off my quest. When I next look through the library, I’m sure I’ll come up with another 5, 10 or 20 favorites in an instant. So there you have it. I hope 2011 turns out even better. My horizons have certainly broadened this year, so the sky is the limit you could say for next year. What do you think of my selections? Kristen - These are awesome pictures, Kurt! I think the ones with the firelit rocks are my favorites (I also really love the sunburst through the redwoods). Reading about how each picture was made makes them all the more compelling. edinblack - Pictures look great! Found this through your Twitter. Kurt - Thanks Ed and Kristen!